While hoses are obviously necessary for tasks such as watering plants, they can also be exceedingly annoying to deal with. Because they’re so long, they’re prone to tangling and twisting. Fortunately, there are now hoses that do not tangle and twist: retractable garden hoses. Retractable hoses will stretch to distances of over 50 feet while in use, and then instantly shrink to around 15 feet in length while not being used. For many, they are the ultimate garden hose option. But what is the best retractable garden hose on the market? Let’s check it out. 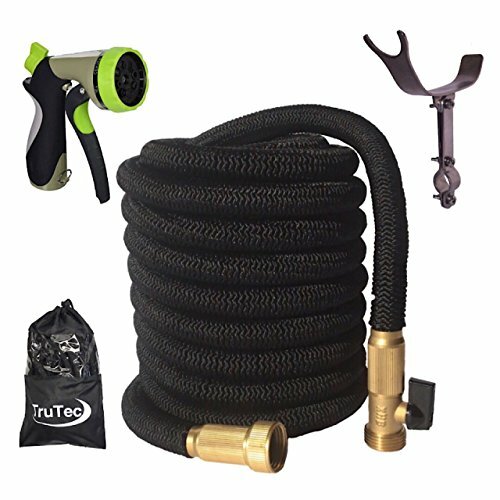 What Are The Best Retractable Garden Hoses In 2018? 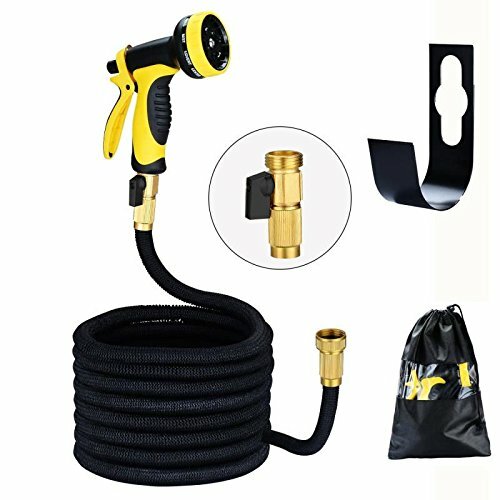 1 What Are The Best Retractable Garden Hoses In 2018? 2 What Should You Consider When Choosing a Retractable Garden Hose? Kicking off our list is the lifecolor Garden Hose. This hose is tough, durable, and capable of expanding to a full 100 feet in length. While it’s a little on the expensive side, it provides more than enough value to make it worth its cost. When it’s retracted, it measures in at 33 feet in length. It possess an inner-tubing which is made out of rubber, and an outer portion which is made out of protective polyester. With a ¾-inch brass connector, it will attach to all standard size outdoor faucets. It can handle water temperatures of all kinds, typically ranging between 41 degrees fahrenheit and 113 degrees fahrenheit. 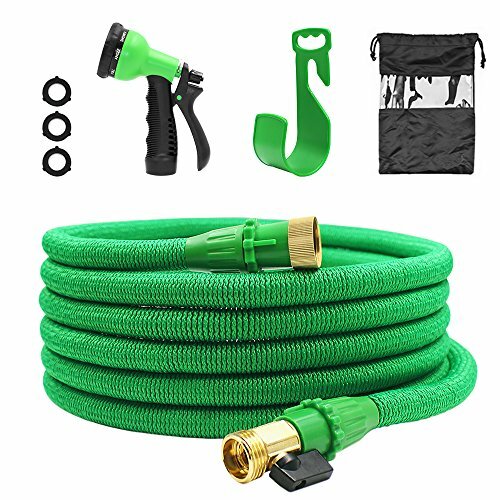 This hose comes with an adjustable sprayer, which is a great perk if you’re in need of one. With an included 12-month warranty, it’s backed reliably by its manufacturer. If you’re looking for the bets, this is what you’re looking for. A hose that’s on the same quality level as, but just a bit shorter than the lifecolor reviewed above is this one from TruTec. It measures in at 75 feet when totally expanded, allowing for it to reach across most yards. 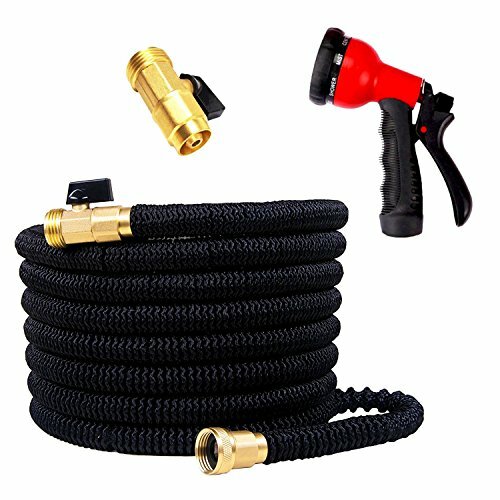 When it’s retracted, this hose measures in at around 25 feet in length; easily small enough to store compactly into your shed or garage. Equipped with a ¾-inch attachment, it accommodates all standard-sized outdoor faucets. The inner-tubing of this hose is made out of reinforced latex, allowing it to withstand quite a bit of water pressure. To prevent punctures, it sports a tough polyester exterior. Like the lifecolor hose, this one comes with an adjustable sprayer. Also like the lifecolor, it comes with a 12-month warranty. The only real difference between the two is in their length. Choose yours according to your length needs. If you’re looking for a high-quality 50-foot retractable hose, you might very well be interested in this one from VicTsing. Quality-wise, it’s right on par with the TruTec and lifecolor hoses reviewed above. It expands between around 15 feet when retracted to around 50 feet when completely filled with water. Possessing a ¾-inch brass fixture, it can attach to all standard outdoor faucets. The core tubing on this hose is made out of a reinforced latex which is capable of withstanding tons of wear and tear. To protect this latex, it’s equipped with a very tightly woven polyester cover. Unfortunately, this hose does not come with an adjustable sprayer. For this reason, its price is a little on the expensive side. But if you’re looking for quality, you’ll get it with this hose. A very solid mid-level hose is this one from Keepax. It measures in at 50 feet in length, meaning that it won’t accommodate large yards, but will be just fine for smaller ones. At its minimum, it measures in at around 15 feet in length. Its length after that depends completely upon how much water is filling it. Like most hoses on the market, it’s equipped with a ¾-inch attachment which will connect it sufficiently to all standard outdoor faucets. Its core is made out of a double layer of latex, giving it terrific strength against both external and internal wear and tear. To help protect it from punctures, it’s equipped with a tough polyester sheath. Another good aspect of this hose is that it comes with an adjustable sprayer. It will be ready to go as soon as you’ve received it. 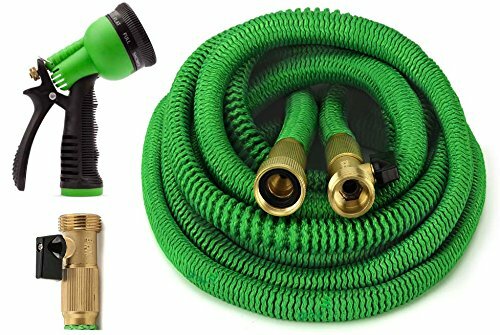 Perhaps the best retractable garden hose for the money is this one from GrowGreen. Available for about ⅔ of the price of the VicTsing, it even comes with an adjustable sprayer. This hose expands between around 15 and 50 feet in length, making it big enough for most small and medium sized yards. It comes equipped with a ¾-inch connector, allowing it to sync up with all standard sized spigots. The inner-tubing on this hose is made out of durable, reinforced latex which can withstand tons of abuse. To keep it protected, it’s also equipped with a polyester outer cover. Where you might run into a problem with this hose is in the construction of its attachment. At times, it’s prone to leaks in the area where it connects with a faucet. Apart from that, this is a very good buy for anyone who needs something basic to have around the house. 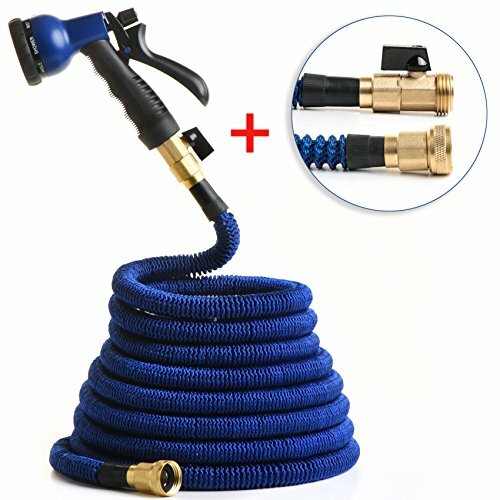 Another solid retractable hose for the money is this one from Hippih. Available for around the same price as the GrowGreen reviewed above, it offers much of the same in terms of construction quality and performance. This hose measures in at 50 feet long, making it big enough for the vast majority of yards. At its shortest, it retracts to around 15 feet in length. With a ¾-inch faucet attachment, it’s equipped to accommodate the vast majority of backyard spigots. Its inner-tubing is made out of reinforced latex, allowing it to withstand both internal and external abuse. To help it overcome external abuse, it’s equipped with a thick polyester protective sheath. 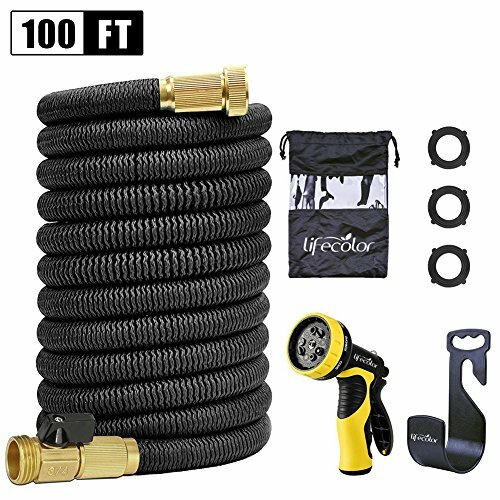 In short, this is a solid retractable hose for a fair price. 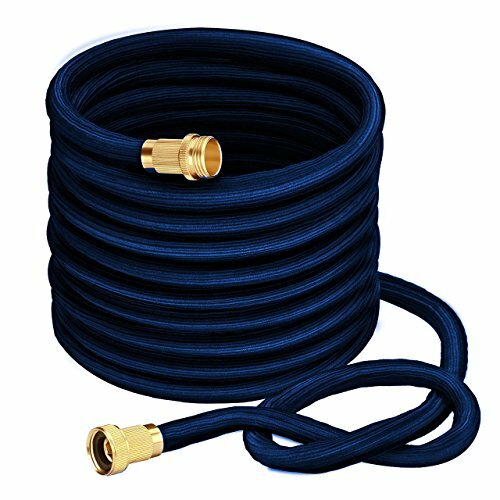 This hose from GardenDADY is right on par with the Hippih hose reviewed above, and is even available for around the same price. And unlike the Hippih, it comes with a sprayer gun. This hose measures in at 50 feet in length, accommodating the vast majority of yards that you’ll throw at it. When it’s retracted, it shrinks down to around 15 feet in length, making it ridiculously easy to store and transport. Its inner-tubing is made out of a reinforced latex that will have no trouble holding high water pressures. To protect its exterior, it’s equipped with a tough polyester sheath. Overall, this is a very solid retractable hose. If you’re looking to get a sprayer gun and a hose in the same purchase, it’s not a bad option at all. Coming with a 90-day, money-back guarantee, it’s entirely covered by its manufacturer. 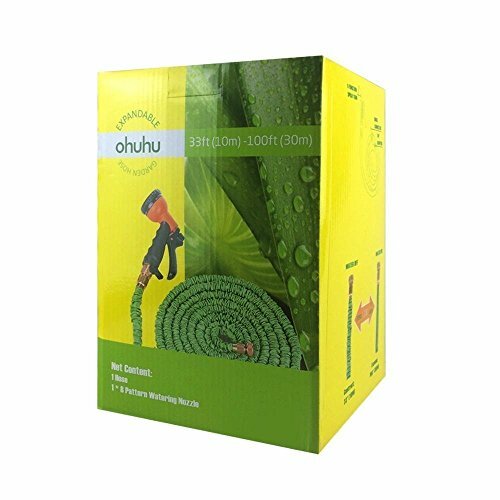 If you’re looking for an exceedingly inexpensive, 100-foot retractable garden hose, you might very well be interested in this one from Ohuhu. Available for less money than the GardenDADY reviewed above, it will give you tons of bang for your buck. While it’s 100 feet in length at its peak, at its minimum, it retracts to around 33 feet in length. This means that it will cover yards of just about all sizes. It possesses a reinforced latex inner-tubing which can handle quite a bit of water pressure. Protecting its exterior is tough polyester protective cover. Where this hose runs into problems is at its attachments. While they’re not terrible, they’re also not of excellent quality. In most cases, they will not last as long as attachments on higher-end hoses. But if you’re looking for something on the cheap, this might be a decent option for you. Next up on our list is the RawElement Expandable Hose. Measuring in at 50 feet in length, it offers fairly standard functionality and durability and a fairly standard price. We should also note that it comes with a sprayer gun. While it extends to 50 feet, it retracts to around 15 feet in length. This makes it very easy to store in your shed or garage. The tubing of this hose is made out of reinforced latex which is designed to withstand water pressures both low and high. Its exterior is protected by a tough polyester cover. In essence, this is a solid retractable garden hose that will get the job done. There’s no good reason not to buy it other than the fact that there are comparable hoses on the market which are available for slightly less money. 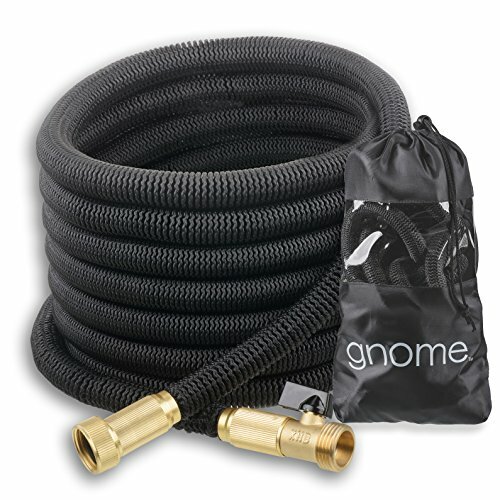 The last hose on our list of reviews is this one from Gnome. Measuring in at 50 feet in length, it’s a solid budget hose at most. At its minimum, this hose retracts to around 15 feet in length, meaning that it’s easy to store and transport from place to place. It’s specifically designed to not twist or kink. To prevent internal destruction, it’s made with a reinforced polyester inner-tubing. A tough, polyester protective sheath guards it from external stimuli. Where this hose doesn’t measure up to other hoses is in the construction of its attachments. They are prone to leaking, and possess very questionable durability. For that reason, this is a last resort budget buy at best. What Should You Consider When Choosing a Retractable Garden Hose? For the most part, every retractable garden hose you come across will be about the same. There are only a few factors which contribute to a specific hose’s quality level. Nonetheless, these factors must be examined with an eye for detail. They include length, construction quality, materials, and durability. These hoses come in all different sizes, typically spanning lengths from 25 feet to 100 feet. The one you choose is completely dependent on your property and specific needs. If you’ve got a large yard, you’ll need a 100-foot hose at the very least. Have a small yard? You can likely make due with a 25-footer. When examining a retractable hose’s construction quality, it’s important to pay special attention to its faucet attachment area. This is the area, if any, which will result in sub-standard functionality. Make sure that it fits firmly to the body of the hose so that there is no leakage occurring at the base of the hose. The vast majority of retractable hoses are made out of latex and polyester. This materials are typically very functional when it comes to the operation of a retractable hose. Latex can withstand quite a bit of water pressure while polyester can prevent external punctures to said latex. When it comes to durability, a retractable hose is only as strong as its materials. A reinforced latex inner-tubing is your best bet if you’re looking for a hose that will withstand the test of time. A polyester protective sheath will also help to prevent external punctures.